Marmitek's Gigaview 745 video tranmission system uses a secure digital transmission method (dubbed WiVi) to beam video around your home. This has an effective range of up 100 metres (or 30 metres if there are walls or ceilings in the way). It also means there's no need to fiddle with antennae. The Gigaview 745 also uses a transmitter and receiver setup with each unit powered by 5V adapters. 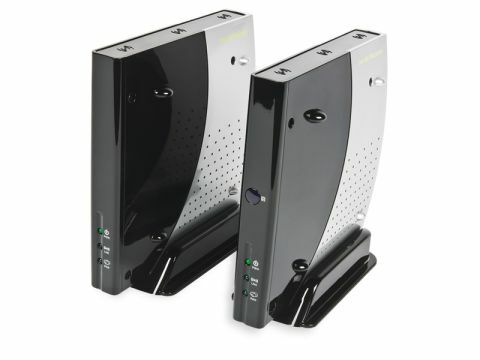 Resembling stylish modems, these units can be vertically mounted if required using the supplied stands. Front mounted LED indicators show when they're powered and whether they're transmitting or receiving. An IR extender cable is included which connects the transmitter to a window on the front of the receiver to relay remote commands back to the source. Disappointingly, there's no Scart connection option and therefore no RGB support. You've a choice of either S-video or composite video. Each unit also sports a 'Paring' button on the rear for securing the wireless connection. To minimise interference from other devices (such as a Wi-Fi network) automatic 'Dynamic Frequency Selection' is used to switch between 23 different channels. We tested the units in a medium sized house using a Sky+ HD receiver and a PlayStation 3 console located in a downstairs room and a TV located upstairs. Video, audio and were faithfully relayed with little fuss or interference and the remote relay allowed us to browse the Sky EPG at acceptable speed. S-video pictures are acceptable, but the limitations of composite mean that a faithful picture is still an inferior soft-looking one. The Gigaview 745 seems rather backward looking in this increasingly hi-def age. The admission fee of £270 is also hefty for what is admittedly a reliable audio and video slinger. If HD isn't of primary concern at the moment, you might be better off setting for a more conventional and cheaper SD video sender instead.